I am happy to say that last night’s brewing went very differently from my first brew day. Having time to give thought to my process and problems, as well as my experience bottling helped organize my actions and avoid issues. Also I didn’t slice open my thumb. The recipe for this beer can be found here. The first major improvement was an idea I had to prevent my mash bag from burning to the bottom of the pot. 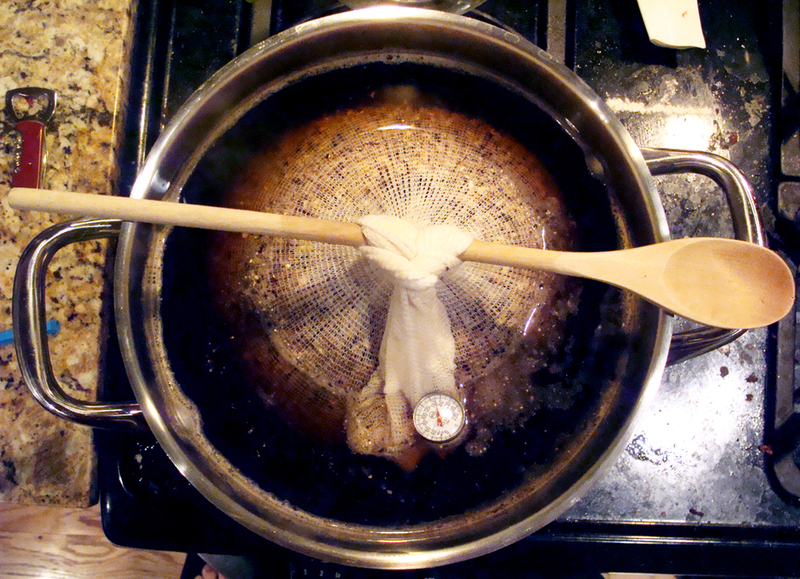 Once I had heated one gallon of water to 154 degrees F, I simply tied the grain bag to a spoon, and placed across the top the pot. I also was able to poke my thermometer through the tail of the grain bag, so that I could constantly monitor the mash temperature. So long, burnt bags and scalded hands! This time I mashed in my two gallon pot, allowing for more height for the same volume of water as used last time. I filled the pot as high as I could with the grain bag submerged. The temperature remained steady with very little heating. If I turned on the heat, I’d set it quite low and check the temperature every 5 minutes or so. The temperature never left a range of 150-156 degrees F during the mash. However, I also tried sticking the thermometer into the center of the grain bag, which measured about 20 degrees F lower than the water itself. Even when I moved the thermometer to the outer end of the grain bag, but with the probe still in the grain, the temperature showed a 10 degree dip. I expect that this is the temperature that really matters, which is supported my estimated efficiency was below 50%. I haven’t been able to find much on the internet on the proper way to measure the temperature of this sort of a mash configuration, and will probably look into other possible configurations I could use with my current equipment. After mashing, I sparged by sitting the grain bag in a colander and dumping about 2 gallons of 170 degree F water onto it. I set the grain bag and colander over a bowl to collect anything that dripped through during the boil, and periodically emptied the bowl into the brew kettle. The boil went much more smoothly with the lid off, with no risk of boil-over or deposition of crud onto the sides of the kettle like last time. About half way through the boil, I sanitized a one gallon pot, filled it with water, and placed it in the freezer to cool down. In the final 10 minutes, I put a saucepan into the kettle to sanitize it for ladling, and brought 1.5 cups of water to boil in another saucepan. This boiled water was for rehydrating the dry yeast, something I was interested in for avoiding the hassle of making a starter, and additionally to see if the higher pitching rate of dry yeast would result in a faster take-off for fermentation. I cooled the boiled water in a cold water bath until it was about 100 degrees F, and then added the yeast and covered it. Meanwhile I added the chilled water from the freezer to the wort, and moved the kettle into the cold water bath. By stirring the bath, the temperature dropped to 100 degrees F in 30 or 40 minutes. At the same time, I sanitized a rubber bung, my fermenter, my siphon and a hose, my beer thief, my blowoff assembly, and my funnel and screen. My new spray bottle helped hit anything that might need it after some handling, although I also sanitized my hands. I first tried to transfer the wort to the fermenter via “the whirlpool method.” The idea is that by stirring the chilled wort into a cyclone, a secondary (Ekman pumping) flow is established through the depth of the fluid that sweeps trub into the center of the kettle. One simply has to siphon the wort from around this cone of trub. The primary flow (blue) is the stirred whirlpool in the kettle. This establishes a secondary flow (red) that sweeps trub into the middle. This secondary flow is called Ekman pumping. Figure from T. H. Solomon and I. Mezic, Nature 425, 376-380 (2003). I tried this method, but found that there was still a good deal of trub in suspension in the wort (perhaps as a result of the stirring itself? ), even having used Whirlfloc. I therefore ditched the siphon and simply ladled out of the kettle into the funnel using my saucepan, clearing the screen with a spoon when necessary. I topped off the fermenter with water from the tap, after which it was at about 70 degrees F. I pitched the yeast, stuck on the blowoff tube, and moved the fermenter into my room. So far (after about 18 hours) visible signs of fermentation have yet to manifest. I didn’t proof my dry yeast with sugar, so I have no way of knowing if they were viable. I did, however, remember to get an OG reading this time (it was 1.055 as I expected). If in several days there is still no visible fermentation, I will take a gravity reading, and pitch new (and proofed) yeast if there has been no change. This entry was posted in brew day, learning and tagged coffee stout, narrative, physics, stout on February 10, 2013 by Dylan Bargteil.